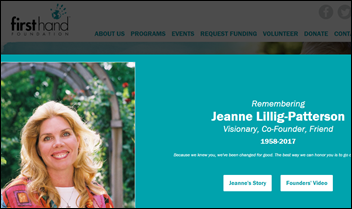 Jeanne Lillig-Patterson, the 59-year-old founder of Cerner’s First Hand Foundation, died Monday of cancer less than two months after death of her husband, Cerner Chairman and CEO Neal Patterson. She was diagnosed with metastatic breast cancer 10 years ago. 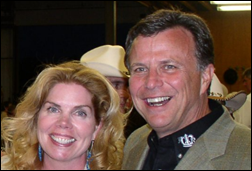 Neal Patterson died July 9 of cancer complications. He was 67. First Hand impacted 300,000 lives in 93 countries and supported health screenings and educational programs that involve one-fourth of students in the Kansas City area. Lillig-Patterson was Cerner employee #7, earning her the internal nickname “Double O Seven.” She got the job after responding to a 1980 ad by what was then Patterson, Gorup, Illig & Associates, which hired her for her ICD-9 coding background as a hospital admitting department employee. PGI was doing contract work for non-healthcare companies when it was hired by a pathology practice, with the founders, Lillig-Patterson, and other employees scrambling to write the COBOL code that would eventually form the PathNet laboratory information system. Lillig-Patterson suggested Cerner as the company’s name in 1984 after noticing the word in a language dictionary as a group led by Neal Patterson tried to come up with something more memorable than PGI. The Pattersons had two children together – Cortney and Will – as well as Clay Patterson and Lindsey Patterson Smith from Neal Patterson’s prior marriage. From Generic Substi-Tooter: “Re: HIStalk. I’ve been a reader for six years. Just wanted to let you know that I appreciate the work you’re doing. Seems like you have a small staff helping as well, so tell them to keep up the good work. You definitely catch a lot of flak from readers about Epic or Cerner bashing, which is funny to read since I’m guessing many of those come from the company that’s had the bad press.” Thanks. People sometimes think the HIStalk team is substantial, so this is a good time to recap. I write every word on HIStalk except when I take time off, during which Jenn covers for me (she also writes HIStalk Practice). Lorre does everything that doesn’t involve writing, including webinars, with occasional help from Brianne. Lt. Dan writes the daily headlines, while Dr. Jayne’s contributions run twice each week. That’s everybody, maybe three FTEs total who each do our own thing without requiring a lot of collaboration. I started HIStalk in 2003 and have been accused nearly constantly since of bashing vendors who would prefer that health IT “news” consist entirely of their shiny, happy press releases that other sites run unchallenged. Like the industry itself, HIStalk can be rough around the edges, but I don’t push back from the computer at the end of the day until I’m reasonably proud of it. 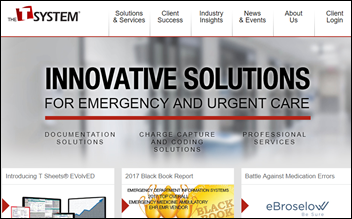 Equity investor FNFV acquires ED clinical documentation and coding vendor T-System for $200 million in cash. FNFV plans “multiple acquisitions” to accelerate T-System’s growth. 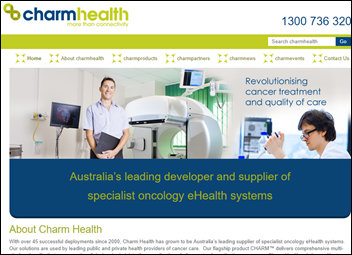 In Australia, Citadel Group acquires oncology EHR vendor Charm Health from its venture capital owner. 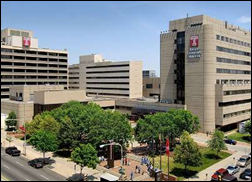 Temple Health (PA) chooses Sectra PACS. The VA selects Diameter Health’s CCD Analyzer to support clinical data quality surveillance. Pharmacy benefits manager Magellan RX Management will offer its customers CoverMyMeds for electronic prior authorization. Michigan Medicine names interim CIO Andrew Rosenberg, MD to the permanent role. Christopher Rieder (Brookdale University Hospital and Medical Center) joins anatomic pathology practice company Aurora Diagnostics as CIO. MedeAnalytics hires Kerry Martin (Cerner) as SVP of sales. Jamie Coffin, PhD (SourceMed) joins genetic screening company Sema4 as president/COO. Health Catalyst launches Data Operating System, the result of a $200 million development project that combines vendor-agnostic data warehousing, clinical data repositories, and HIEs into a single platform. Its attributes include reusable logic, real-time data streaming, ingestion of both structured and unstructured data, closed-loop EHR integration, microservice API architecture, machine learning, and an agnostic data lake. 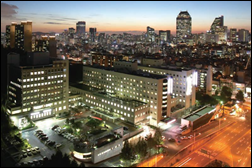 In South Korea, Gangnam Severance Hospital, Samsung, and virtual reality developer FNI will work together to developer virtual reality technology for mental health, including a VR-powered diagnostic tool. Datica’s cloud platform for digital health apps earns HITRUST certification for security risk mitigation and PHI protection. 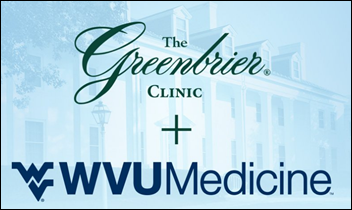 The executive clinic of The Greenbrier resort (WV) will partner with WVU Medicine, including adopting its Epic system. 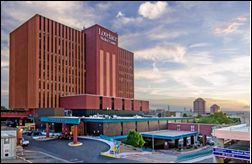 Lovelace Health System (NM) completes its implementation of Epic. 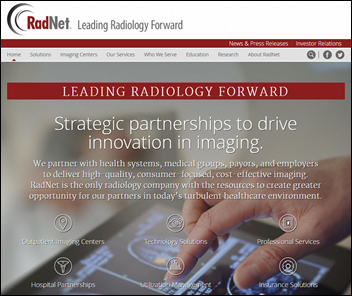 Diagnostic imaging vendor RadNet partners with two Patrick Soon-Shiong controlled organizations – NantWorks and six-hospital Verity Health – with Verity Health taking over RadNet’s Breastlink business in California and all three organizations collaborating on clinical trials, data analytics, and AI-powered predictive modeling. UnitedHealthcare announces PreCheck MyScript, which gives prescribers cost and coverage information at the point of prescribing and automates prior authorization for patients covered by the insurer’s health plans. The service being integrated with Allscripts EHRs and DrFirst. 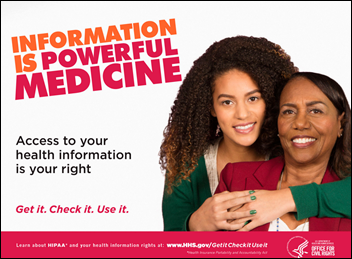 HHS OCR launches “Information is Powerful Medicine,” a campaign to let the public know that HIPAA gives them the right to view and obtain copies of their health information from their provider. A New York Times report observes that HHS – which is legally responsible for overseeing the Affordable Care Act – is instead spending taxpayer money to oppose it in promotional videos and is constantly criticizing the law via anti-Obamacare tweets by HHS Secretary Tom Price. According to a law professor, “Here, it’s an agency trying to destroy its own program because it opposes it. 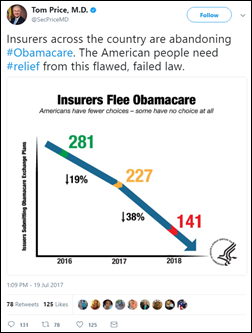 It is inconsistent with the constitutional duty to take care that the law is faithfully executed.” The article also calls out the White House’s drastic cutback in insurer-paid funds for signup advertising and the removal of ACA information from the HHS.gov website. Enteprise customer communications management solutions vendor Smart Communications will integrate its technology with Casenet’s TruCare population health and care management platform to allow health plans to deliver personalized communications to members and providers via their preferred channels. Cerner creates an advisory group to guide its work on the VA’s EHR project, with members that include former Senator Bob Kerrey; former VA CIO Roger Baker; former HHS Acting Assistant Secretary for Health Karen DeSalvo, MD; former VA secretary James Peake, MD; and former VA Undersecretary for Health Jonathan Perlin, MD, PhD. The Locky ransomware is being spread by a new technique in which a browser user is convincingly warned that a required PC font is missing, with the malware installing itself if the user clicks the update button. A Boston Globe report finds that rapidly expanding for-profit hospital chain Steward Health Care System has failed to file state-required financial, quality, and merger plan information and has not paid fines that were imposed for its lack of transparency. It has also stopped providing individual hospital data. A Harvard professor says the private equity-owned chain, which is going national, might be trying to hide the reality behind its claimed turnaround of its acquired Massachusetts hospitals. A Dallas medical testing laboratory accused by the federal government of a $100 million fraud scheme files a lawsuit to prevent state and federal agencies from revoking its laboratory licenses. 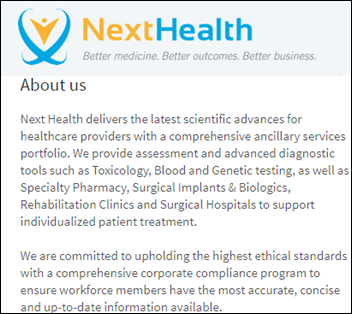 Two of the principals of Next Health and Medicus Laboratories also face similar charges for their work at a now-bankrupt doctor-owned hospital chain that prosecutors say paid $40 million in bribes to generate $200 million in paid claims as an out-of-network provider. The executive of one of Next Health’s marketing contractors has been indicted in an unrelated case for giving soldiers Walmart gift cards in return for saliva and urine samples that were used to perform unnecessary tests for which Tricare paid, using a similar method to drum up business for Next Health by approaching people in Whataburger restrooms and offering them $50 gift cards for providing urine samples for a “wellness study.” One patient earned $600 for providing a dozen urine samples that were used to bill UnitedHealthcare Group $217,000, with the Next Health marketing rep bragging that he was earning $100,000 per month for brokering kickback payments to doctors. Next Health told patients they wouldn’t be billed for their part of the cost, fearing that their complaints would trigger an investigation. In India, police are investigating the perinatal asphyxia deaths of 30 children at a state-run hospital after families complain that the hospital did not give the babies oxygen. This follows a previous incident where 60 children at another hospital died after oxygen supplies were reportedly cut off due to non-payment of the oxygen supply company’s bills. Here’s another 30-year look back from Vince, who describes the health IT news of September 1987 and what it means today. He would love to hear stories from fellow pioneers, especially if they dig into their own closets for yellowing industry ephemera. Besler Consulting will present at the NJ HFMA Regulatory & Reimbursement Educational Program on September 12 in Edison. CompuGroup Medical will exhibit at PainWeek September 5-9 in Las Vegas. CoverMyMeds will exhibit at the AAFP Family Medicine Experience September 12-16 in San Antonio. Cumberland Consulting Group will exhibit at the MDRP 2017 Summit September 11-13 in Chicago. I had to giggle at the font they chose for the ransomware. It’s an underrated font if you ask me. 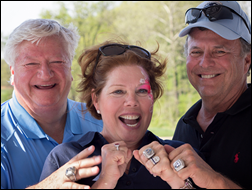 RE: Jeanne Lillig-Patterson, the 59-year-old founder of Cerner’s First Hand Foundation, died Monday of cancer less than two months after death of her husband, Cerner Chairman and CEO Neal Patterson. She was diagnosed with metastatic breast cancer 10 years ago. I didn’t know either, but how sad. 🙁 Yet, how sweet they can be together again. I know, schmaltzy. Recall that was in the days before Internet (Yes, Virginia, there once was a time when there was no Internet, and you actually “dialed” a phone), and no ease of finding resources, and these pubs were one of the only ways to find a consultant (remember Gary Braler who faithfully had his 1/8 page ad?) or a connection to a vendor. I even got a job responding to an ad in the back of Computers in Healthcare that set me on my way to success in this industry. Good stuff. Congratulations to Charm Health, a great company with good people doing good work, on new ownership and special kudos to CEO Gary Lakin one of the industry’s true “good guys”. ACA was dying and on its last breath with a no-resuscitate status anyway. HHS has no obligation whatsoever to support a failed tax .. ehem…healthcare law.